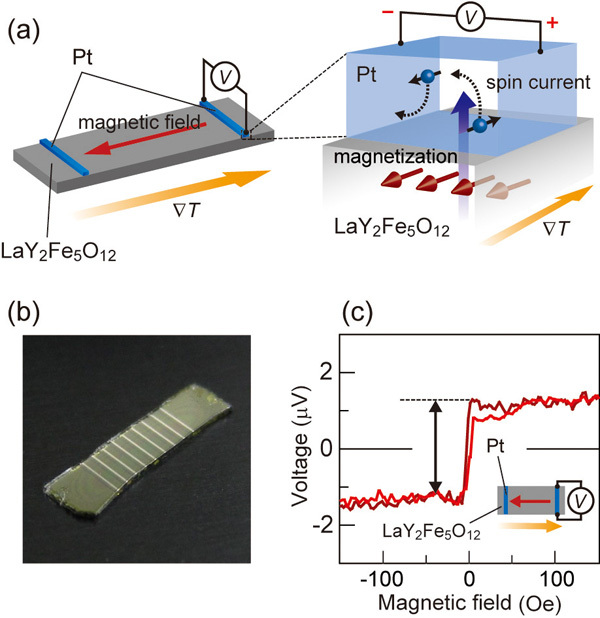 Surface and Interface Research group (Saitoh Group), in collaboration with Japan Atomic Energy Agency, FDK Corporation, Delft University of Technology in the Netherlands, and Fudan University in China, has discovered that a spin-Seebeck effect, generation of spin currents as a result of temperature differences, appears in magnetic insulators, which has been measured only in ferromagnetic metals. Furthermore, the group has showed that, by combining this phenomenon with the relativity effect in a solid (inverse spin-Hall effect), thermoelectric power can be generated from heat flowing in an insulator, which has seemed to be impossible. The achievement would enable the use of insulators, with less energy loss due to heat transfer, for thermoelectric conversion elements, which could result in widening design possibilities and installation sites of such elements and contribute to environment-friendly electric technologies. This work was performed as a part of the research programs of New Energy and Industrial Technology (NEDO) and Japan Science and Technology Agency (JST). The research result was published in the scientific journal "Nature Materials" as an Advanced Online Publication (September 27, 2010), and was reported in news papers of Nikkan Kogyo Shimbun, Denki Shimbun and Nikkei-Sangyo Shimbun. and the mechanism of thermoelectric voltage generation. (b) The sample system used in the present study. (c) Magnetic field dependence of the thermoelectric voltage generated in the sample system.